← Whatever Happened to Baby Jane? 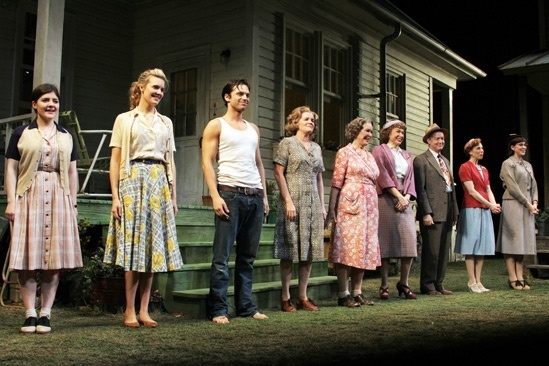 I went to see the Broadway revival of William Inge’s Picnic a couple months ago. The reviews had not been great, but I wanted to see it because I love William Inge. I grew up in Independence, Kansas, Inge’s hometown. In the spirit of full confession, I must admit that though I love him now, I hated his plays when I was growing up. When I was Jelly Beamis in a local production of A Loss of Roses, I complained to the director that Inge’s plays were depressing, that the endings were all too sad. She did not say much, gave me an odd smile and we never discussed it again. I remember sitting in symposiums every year at the Inge Festival, listening to Inge scholars dissect the choices that Lola and Madge and Cherie and Bo and Hal and Deanie and Howard and Rosemary could have made that would have altered the trajectory of their lives. Particularly with Picnic, I found it so sad that Madge would run off to Tulsa to join a man who would be a likely failure. I thought it pitiful that Rosemary found herself on her knees, pleading a man she may not even love to marry her. And then a couple months ago, on Broadway, I watched it again with a Madge that really seemed like a pretty high school girl that I might have grown up with. I saw things in the short scenes with the other old maid school teachers that I’d never noticed before. It occurred to me that perhaps Irma Kronkite, played by the wonderful Maddie Corman, was the Inge stand-in because she was a teacher in this small Kansas town, but she lived for her summer studies in New York where she could be unleashed, not unlike what Inge did while he was a teacher in the Midwest before his success as a playwright. And mostly, I was affected by how HAPPY I was to see Rosemary and Howard go off to get married and begin a life together. I saw love there that I had not seen before and I saw hope that, while it may not be the fairy tale ending one dreams of as a child, I thought, they are going to get used to living with each other and they will keep each other warm at night and it will be okay, maybe even better than okay. As I watched the last few moments of the play beside my partner, whom I met when we were both already in our early 40s, I thought about how surprised I had been to find love again as a middle-aged man. There is a thread of hope that runs through Inge’s plays, some thin, some a little thicker, but there is always hope. It took me a few years to see it, but it was there all along.